up to 6 oz and Come with Press on Labels. 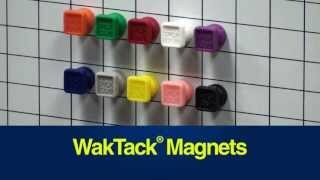 Powerful WakTack® magnets are a super-handy tool. They hold almost anything tight to steel and are fun to play with too. Made of nickel-plated neodymium, encased in our patented multi-purpose EZ-Grip® plastic holder, one of these extra-strong magnets holds up to 10 sheets of paper or 6 oz. of keys on your steel whiteboard. WakTacks® come in 10 colors for color coding multiple applications. WakTacks® work indoors and outdoors or anywhere you have a flat steel surface. They come with press-on labels that fit the magnet's recessed top and can be prepared on your computer with the CD/ROM template. (downloading instructions included). 5/8" x 5/8" x 3/4"h. 10 Bright Colors. Patented.